I feel the wind in my mane. The tussock beneath my feet pass on a blur. I call out to my wonderful foal, Mercury, the sonn of Mojo and myn. The stallion of the herd, Mojo, is leading us to fresh grass, the nice, fresh bright green grass. We arrive at a secret gully, that only our herd know about. Mojo suddenly shoots his head up in alarm. His favorite mare, Angel does so too. She always copies him. My foal hurries to me side, and trys to suckel, i push him off, waiting for Mojo’s instructions. Mojo wheeled around in a whirl of air and shoots off. Being in herd, we have to follow him. " Guys, stay alert for any sudden movements" Mojo shouts at us as he is galloping. Suddenly there is a very loud whirring sound.......... - Of a helicopter..... That can only mean one thing........ Its a muster. Me and the herd have escaped many musters. This one.. Well for some reason this one was different. A helicopter cut me off, i knew what was going to happen next. I feel the wind in my mane for the last time, I look at the blur of tussock beneath my feet, and i hear my foals desperate winny’s for his mum. Then i am going down...... It all goes pitch black. friends, my herd, but they are not there. I leap in fright as the loud announcer calls of numbers " GOING ONCE, GOING TWICE, SOLD AT 25.00 DOLLARS TO KIM GLADELAKE, THE OWNER OF THE HORSE SLAUGHTERING COMPANY!" I freeze in fright. H...Horse slaughter? You mean i'm gonna be killed? I plant my hooves firmly into the ground, not wanting to leave. The guy who is leading me brings out a whip, and lays it down on me. I walk quietly forward. The guy who bought me snatched the lead rope and snapped at the man. Kim is halfway leading me up the ramp when.. "STOP! DON'T TAKE HER!" The voice shrills loud and clear piercing through the air. I can't understand what they were talking about then, because it was very loud and rushed. Finally, after hours of waiting, I was led down the ramp by a girl no younger than 10. I bite her, knowing I can get away with it. She turns to me, and I instantly regret hurting her. Tears stream down her face, and she has the look of a shattered heart. She hands the lead rope to another man, and runs away. The man ignores me, and pulls me up another horse float. There already is a shetland pony in there. He give me a nasty look and turns away. The little girl appears, her face red and tear stained. She keeps on staring at me wearily, as if I could make her drop dead. She hung up a yummy looking hay-net. I stared at it. I dont know if it will be poisoned or safe. I decide to take a nip of hay. Ahhhhh…… This is gooood hay. The man ( Who is the girls father) Sharply closes the horse float ramp. It all goes dark. I try and fight, i try to find some light, but there is none. I eventually give in, knowing this might be my last ever fight….. I yet to know what will happen to me. I force myself into a deep, deep sleep. I awaken to a sharp jolt. The horse float has stopped. The man jerks open the horse float ramp. The little girl, whose name is Shari, quietly walked up the ramp. I am startled of what she could do, so i kick out. I narrowly miss her, and end up kicking the side of the miniature pony, who is called Eddie. “ WATCH IT, YOU BLOODY EGG!” He screams. The little girl jumps out of the horse float, startled. The big scary man takes hold of my lead rope and wheels me around, i hit the sides of the float. “ Grrrrrrr.” The man growls. He yanked me into the gravel driveway beneath the float. I take a look at my surroundings. One rundown red barn, one little paddock. I start to feel stressed at what a dump this is, but I stop myself knowing it wouldn't matter because i will probably be dead soon. The man pulls me towards the battered barn. He cracks open the rotting door and leads me inside. It”s better inside than it is outside. There is 3 stalls, all full of rotting straw. The man, whose name i have heard of as Garry, leads me into one of them. I wake from a very deep sleep, to find in my stable, water, hard feed and Shari watching me. “ Hey girl, i have missed you. I had to to to the doctors to get my arm fixed up because of your bite! Dad is very cross with you”……… She whispered. Then she walked away, close to crying. Garry then strides into the stable. “ Im glad you are fattening up! Tomorrow i will train you to be ridden, so eventually my daughter can ride you!” I spent that whole day eating, and trying to make a conversation with Eddie, but with no luck. The next day, Garry came into my stall with a long rope and a harsh looking stick. He tried to put a halter on me, so i bite him. He punches me in the nose. I go quiet, knowing that if i make some noise i might get bashed again. He eventually gets it onto me, and clips a lead rope on. He leads me out of the stable, and then cracks open the barn doors. I am blinded by the bright light, after being in a dark gloomy stable for a while. He leads be behind the barn. There is a correl, that i had not noticed before. Garry takes off the lead rope and clips on a much longer rope. He flicks the rope at me and hits me. I dont understand what he wants me to do! I gallop around the sharp edges of the correl, bucking and carrying on.“ ENOUGH!” Garry shouts at me. I stand stock still, afraid at what might happen if i move.“ WALK AROUND THE BLOODY ARENA AND DO AS I SAY!” I kinda get at what he wants me to do now. I walk slowly around the arena, he hits me with the rope i trot, and so on. Eventually he sets a jump up, around the height of 1 meter. 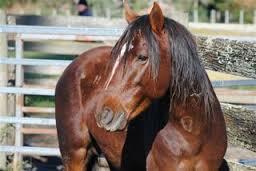 I know how to jump, because of jumping the army ground fences, on the desert road near Taupo when i was wild. He makes me jump it, so i do, with air to spare. He keeps on increasing the jump height, until i am so tired, and am about the flood the correl with my sweat! This weeks lesson is different. Instead of bringing a whip and a long rope, Garry is carrying a saddle and bridle. He ties me up to the corral with a lead rope, a short one this time. He chucks the saddle on my back, i buck in surprise, and he whips me. I have learnt my lesson. He tries to put this nasty metal chain in my mouth! It tastes cold, hard and it clangs against my teeth. He does all the straps up, my head feels all squished and tight. He leads me over to a tall wooden box. I don't want to go, of fear of all the changes that are happening, but my kind nature gets the better of me and i give in and follow him. He makes me stand beside the box. He steps up onto the box, and MOUNTS ME!!!!!!! I buck, gallop and kick out in surprise, trying to get rid of Garry, who's on my back. Its no use, he is too strong. So i decide to stand still. Stock still. As still as a tree. Wait…… Trees don't stand still! They always move! I take off like a rocket, almost unseating Garry. Almost, with no luck. I will have to do what he wants me to, i am under his control. He gives me a kick to move on, then trot, and canter. He faces me towards the 1 meter high jump. I have no choice. I can jump this high on the ground, but not with a rider on me! I have to do it. I take off, i feel as if i have springs on my feet. “ Well done!” Garry shouts, scaring me. Well at least he praised me? Thats a start. Maybe he is not so bad after all….. No. I can't think that.. He hits me! He hates me, and he is rude and bad to Shari. Garry keeps on going on like this, five days a week for 2 months. Then finally it was time for Shari to ride me. I see her all geared up in her riding gear. She hops onto the big box. She put her foot into the styrip and swings her leg over my back, way more gentle and slower than Garry. She gives me a small nudge to go forward, and i respond like a angel. We walk a lap, then trot. We trot over a tiny 30cm jump. I try to the best of my ability, trying to please her. She gives me a small kick to go into the canter, and i do so, trying to please her. “ Good girl!” Shari says. She hops off my back, and slides quietly to the ground. Later that evening she comes to my stable, she comes with a purple and black rug. She expertly chucks the rug over my back, and clips all the clips up. She holds me by my mane and leads me out of the barn. “ Good girl now, don't run off or spook because i'm only holding onto your mane! I think dad hid the halter…” She takes me around to the small paddock, opens the gate and lets me free. “ Good girl, stay there until the morning, I will come out before dad gets up and put you back in your stall. Dad does not want you out in the paddock, but i think you deserve it.” Shari whispers. She kisses me on my cheek and goes back into the house. I explore the paddock, and much to my delight, I find a warm feed, a bran mash, in the paddock. I give my silent whinny of thanks to shari.